HE lives a life that would add a few lines to the forehead of even the coolest mum. He surfs, wakeboards, skydives, rides motorbikes and generally gets his kicks by terrifying himself. 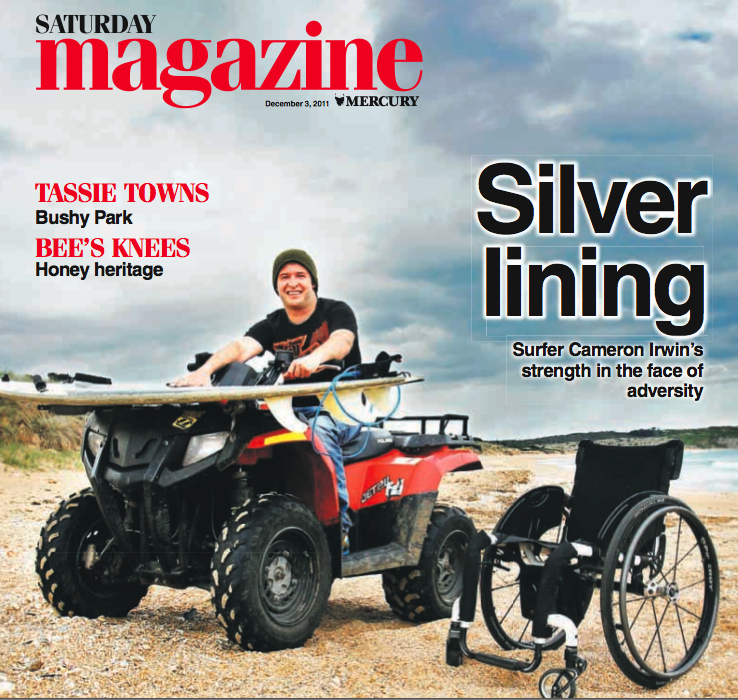 His mates number among the most fearless big-wave surfers in the country – yet they all name Cameron “Stocky” Irwin as the bravest person they know. The reason? He can’t move his legs. Since he broke his neck on the bottom of a Margaret River swimming pool four years ago, the 27-year-old has defied the advice of doctors and anyone else who told him that being disabled meant he was unable. His life is a monument to resilience and adaptation. Cam is now focusing on his biggest surfing challenge yet. 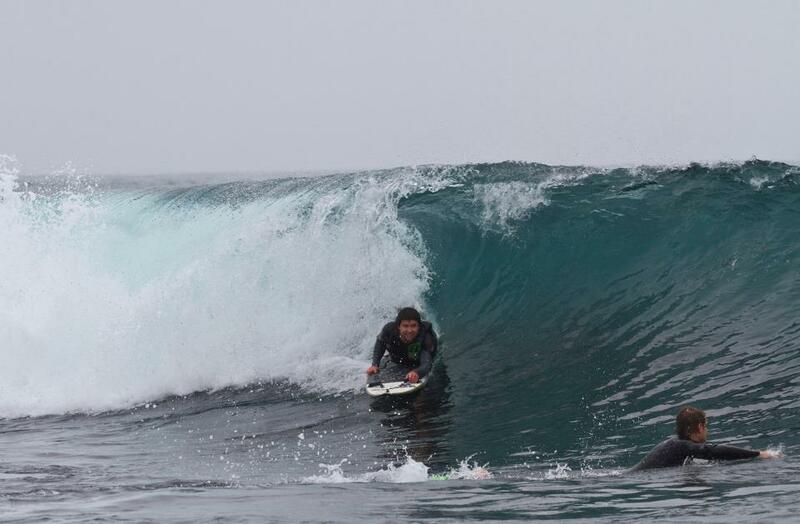 He is planning on tackling Tasmania’s infamous Shipsterns Bluff, arguably Australia’s most dangerous surf break. Yet whatever he does in the future, his mum Jan Jack says his greatest achievement has been his refusal to let a broken neck wreck his life. You can put the man into a wheelchair, but you can’t put the wheelchair into the man. “I dove into the pool, hit my head on the bottom and felt my neck break and I instantly knew: I’ve just put myself in a wheelchair,” Cam recalls the sickening moment with a slightly embarrassed smile on his face; as if he’d broken a stubbie instead of a vertebrae. “I kooked it,” he chuckles in the laconic drawl native to beachside suburbs. During six weeks of total immobilisation, Cam’s resilience shone through. He was instrumental in the recovery of other patients he shared a ward with, one in particular who he says was “just a horrible person to begin with, being really mean to all the nurses.” Cam told his hospital room-mate that he had to shoulder his share of responsibility for his injury. The key, he says, has been accepting blame but not punishing himself. 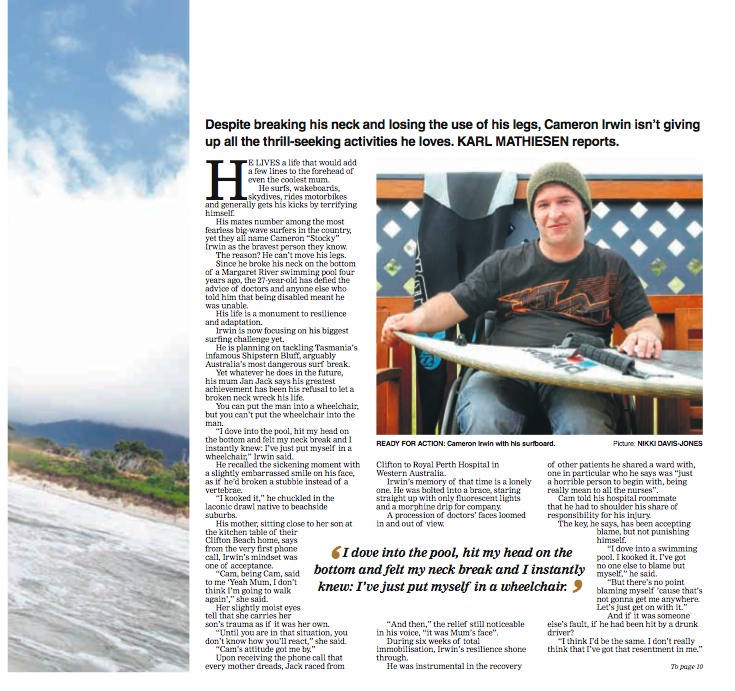 Following the accident, Cam took on ever-increasing physical challenges. His injury was severe. His splintered vertebrae had nicked the spinal cord and he was left a partial quadriplegic. Luckily, he says, “my hands are pretty much awesome”. But he has no movement from the chest down. At first, he says, even taking a bath was an ordeal. With the assistance of a tightly-knit group of mates Irwin recently became the first person in a wheelchair to ride a quadbike from Granville Harbour to the Pieman River and back. 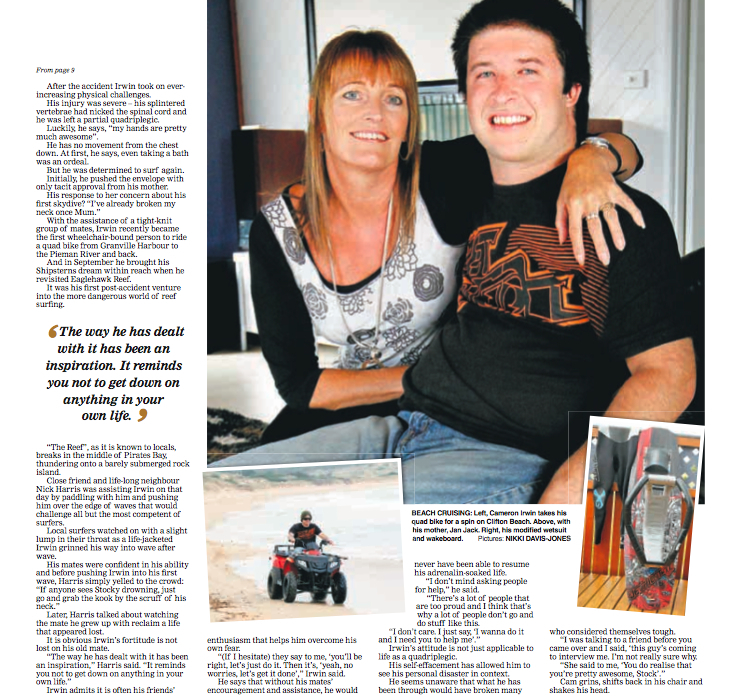 This month the wheelchair-bound waterman brought his Shipsterns dream within reach when he revisited Eaglehawk Reef. 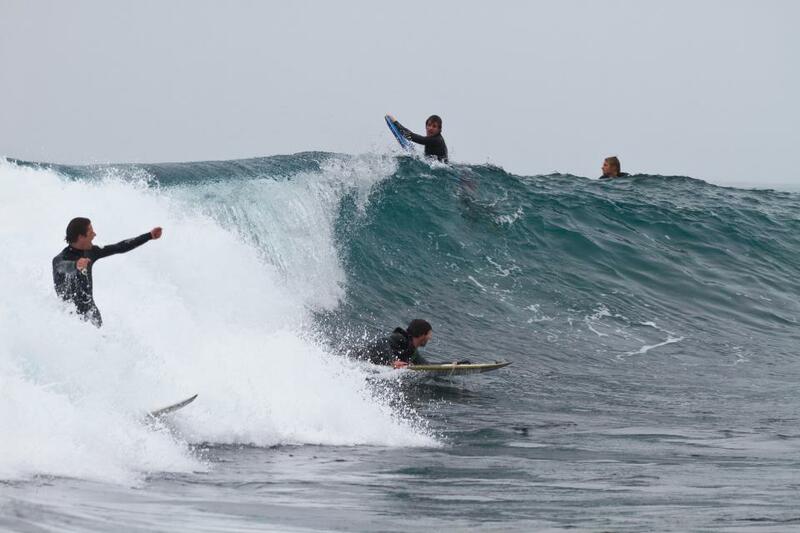 It was his first post-accident venture into the more dangerous world of reef surfing. “The Reef” as it is known to locals, breaks in the middle of Pirates Bay, thundering onto a barely submerged rock island. 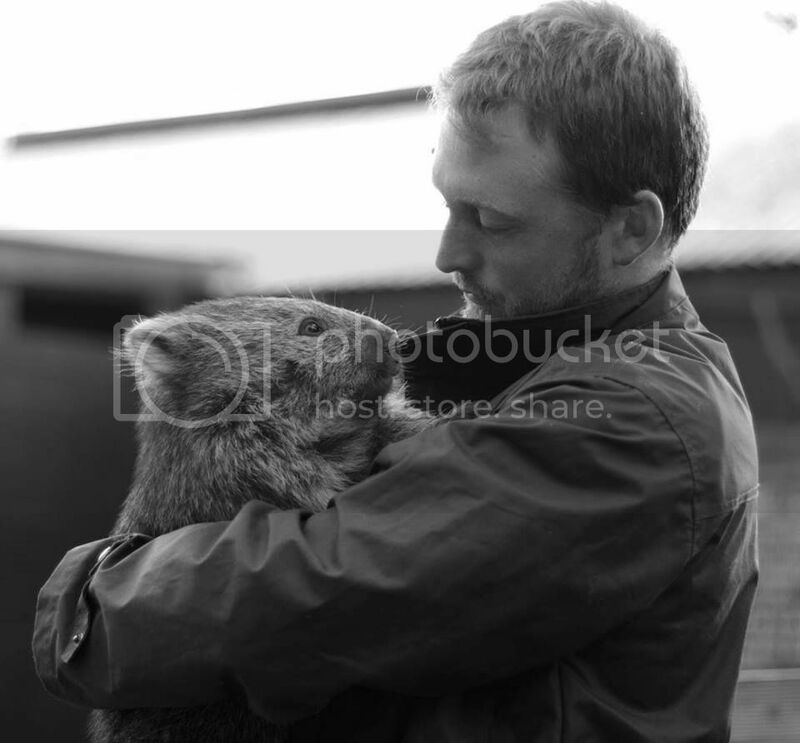 Later, Nick talked about watching the mate he grew up with reclaim a life that appeared lost. 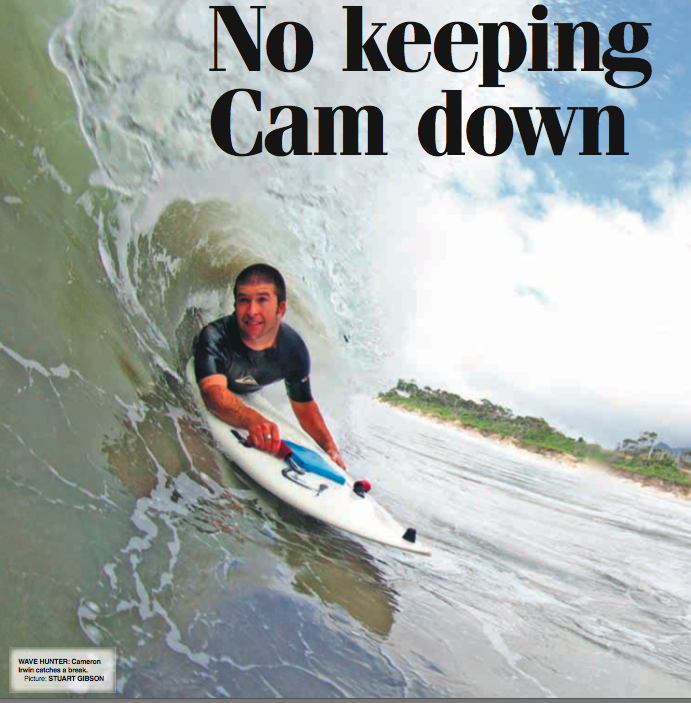 It is obvious that Cam’s fortitude is not lost on his old mate. “The way he has dealt with it has been an inspiration,” Nick said. “It reminds you not to get down on anything in your own life,” he said. Cam admits that it is often his friends’ enthusiasm that helps him overcome his own fear. If he hesitates, “they say to me, ‘you’ll be right, let’s just do it’. Then it’s, yeah, no worries, let’s get it done.” He says that without his mates’ encouragement and assistance, he would never have been able to resume his adrenaline-soaked life. Cam’s attitude is not just applicable to life as a quadriplegic. His self-effacement has allowed him to see his personal disaster in context. He seems unaware that what he has been through would have broken many who considered themselves tough. Cam grins, shifts back in his chair, and shakes his head.